Lancé en mars 2018, BART constitue le plus important collectif de recherche académique dédié à la Blockchain en France. 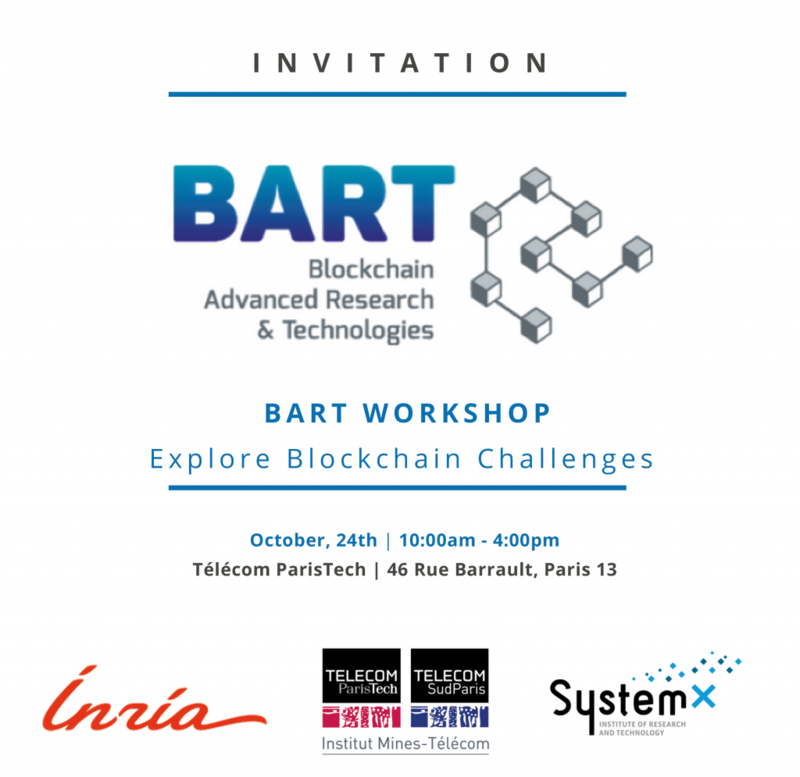 Le 24 octobre, Inria, IRT SystemX, Télécom ParisTech et Télécom SudParis organise un workshop BART sur les défis liés à la technologie blockchain avec la participation d’intervenants de renommée internationale. What is a Blockchain? What does decentralized trust mean? What is the difference between Proof-of-Work, Proof-of-Stake and Proof-of-Membership? How is Byzantine Fault Tolerance (BFT) related to Blockchains? In this talk, I will try to provide some answers to these questions by using the lens of the foundations of Distributed Computing. Time permitting I will also survey the emerging research frontier looking at new hybrid solutions that combine both classic and modern approaches. A long line of recent research has demonstrated that existing cryptocurrencies often do not achieve the level of anonymity that users might expect they do, while at the same time another line of research has worked to increase the level of anonymity by adding new features to existing cryptocurrencies or creating entirely new cryptocurrencies. This talk will explore both of these lines of research, demonstrating both de-anonymization attacks and techniques for anonymity that achieve provably secure guarantees. In the future, there will be many blockchains. Different institutions will require different blockchains to manage different resources, and even within a single institution it may make sense to split a blockchain into multiple shards (distinct co-operating chains) for load balancing, administrative ease, and security. To be successful, a multi-chain enconomy will require the ability to execute transactions that span mulitple blockchains. As an example, we will review the problem of an atomic cross-chain swap, a distributed coordination task where multiple parties exchange assets across multiple blockchains, for example, trading bitcoin for ether. A cross-chain swap protocol must guarantee that (1) if all parties conform to the protocol, then all swaps take place, (2) if some coalition deviates from the protocol, then no conforming party ends up worse off, and (3) no coalition has an incentive to deviate from the protocol. It is an important challenge to understand performance properties and scalability of distributed systems, in particular if these systems use complex security mechanisms, as it is the case for Blockchain systems.The talk describes approaches for measuring complex networked systems. One aspect is to use automated workflows to perform reproducible experiments in a testbed, yielding measurement data of high quality, suitable for benchmarking and modelling performance properties of trustworthy networked systems. Further aspects include investigations of different protocol mechanisms and configurations, and studying real-world deployments.